help of threads. Threads are used in joining parts, power transmission, measuring instruments and lifting the weight. Thread on the nose of the lathe spindle, which holds the chuck, is an example of use of threads. Screws form a convenient and readily detachable means of holding parts tightly together. 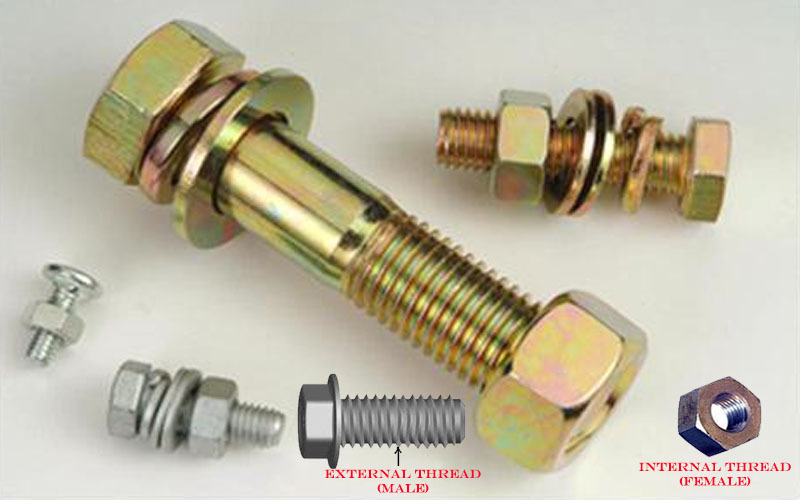 When two or more components are joined together with the help of screw thread, they can be easily dismantled and again it can be assembled if required. A thread is a helical ridge of uniform section that lies on the inside or outside of a cylinder or cone, or cutting grooves of equal length and equal depth on external or internal surface of a cylindrical or coned shaped job are called threads. An external thread is on the outside of the member and internal thread is in the inside of the member. A screw is a mechanism that converts rotational motion to linear motion, and a torque (rotational force) to a linear force. It consists of a cylindrical shaft with helical grooves or ridges called threads around the outside. The screw passes through a hole in another object or medium, with threads on the inside of the hole that mesh with the screw's threads. When the shaft of the screw is rotated relative to the stationary threads, the screw moves along its axis relative to the medium surrounding it. For example; rotating a wood screw forces it into wood. (i) Screw threads are used as fasteners such as wood screws, machine screws, nuts and bolts. (ii) These are used for Connecting threaded pipes and hoses to each other and to caps and fixtures. (b) Speed Reduction - It is used for reduction of speed as in the case of worm drives. (c) Screw Jacks - Used for moving objects linearly by converting rotary motion to linear motion, as in the lead screw of a jack. 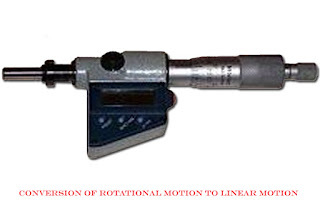 (d) Precision Instruments - It is used for measuring by correlating linear motion to rotary motion (and simultaneously amplifying it), as in a micrometer. 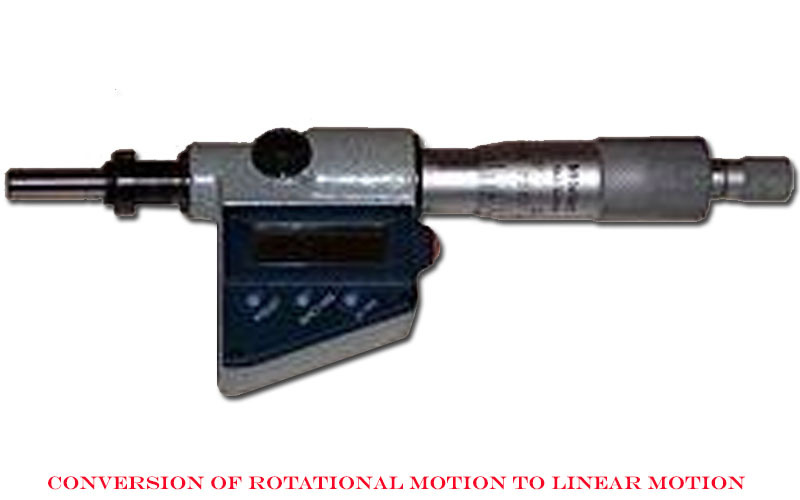 (a) It converts rotary motion into linear motion. (b) It prevents linear motion without the corresponding rotation. (a) Major Diameter - Major diameter is the outside diameter of the threads. (b) Minor Diameter - It is the core diameter or root diameter of the threads. (c) Pitch Diameter - It is the diameter from the centre of the thread. It is an assumed diameter, which passes through the half of the depth of both threads. (d) Pitch - It is the distance between one point of thread to the corresponding point on the next thread. It is measured parallel to the axis of the line. It is also the distance travelled by the nut in one revolution but it is applicable in single start threads only. (e) Root - The bottom portion of the thread where both sides meet is called root. (f) Crest - The top portion of the thread where both sides meet is called crest. (g) Flank - These are the straight sides, which connect the crest with the root. (h) Thread Angle - The angle at, which both sides of the thread meet, is called the angle of the thread or thread angle. (i) Depth of Thread - It is the distance from crest to root measured vertically. (j) Lead - It is the distance travelled by a nut in one complete revolution. Remember in single start threads, pitch and lead are same, but in multi start threads it always differs. Lead = Pitch x Number of starts. (k) Thickness of thread - It is the distance between the adjacent sides of the threads measured along the pitch line. (l) Threads Per Inch - It is the number of threads in one inch length of screw. It is abbreviated as TPI. Threads are classified according to position, shape, direction and start. (i) External - External threads are cut on the outer surface of a cylinder. (ii) Internal - Internal threads are cut inside the bore. (i) Right Hand Threads - Threads, which are sloped towards right hand (when seen the bolt in vertical position) are called right hand threads. By rotating the nut clockwise on the bolt it will move forward. (ii) Left Hand Thread - Threads, which are sloped towards left hand are called left hand threads. By rotating the nut on the bolt in clockwise, it will move backward. (i) Single Start Threads - This thread is cut with only one thread groove all along its length. In this case the pitch and lead are same. (a) British Standard Whitworth Threads (BSW) - Sir Joseph Whitworth made this standard. So it is named after him. Its root and crest are rounded and its angle is 55°. Where D is outside diameter of the bolt. (b) British Standard Pipe Threads - These threads have the same dimensions like BSW. These are cut on pipes having taper of 0.705” per foot. It is used for iron and steel piping and for tubes, gas, steam and water. The size is based on the internal diameter and not on the external diameter of the thread. Thus a1/4" BSP thread has an external diameter of 1/2" approximately. The finer pitch is provided so that enough uncut metal is left on the wall of the pipe since the depth proportionately increases to the pitch of the thread. (d) Lowenhertz Thread - The lowenhertz thread is used to a great extent in Germany on measuring precision and physical apparatus. Its angle is 530 8' and its crest and roots are flat. (e) Seller Thread or American National Thread - It is most popular in U.S.A. Its crest and roots are elliptical. Its angle is 60°. (f) Metric or International Threads - France and other countries adopted this metric standard. It is used in general works. Its angle is 60°. (g) Cycle threads - These threads are also called Cycle Engineers Institute (CEI) threads. It is used in cycle engineering and made in the diameter of 0.056" to 1.5" from 24 TPI to 62 TPI. Its angle is 600. (a) Square threads - These threads are square shaped. These are mostly used in weightlifting, vice spindles, press machine spindle, power transmission and screw jack etc. its angle is 90°. (b) Acme threads - These threads are thick at bottom and the angle is 29°. These are used in lathe lead screw where opening and closing of half nut is frequently required. Depth = 0.5 x P +0.01"
(c) Knuckle Threads - These may be regarded as round square thread. These are used where great strain is applied to threads. The design is not good but it is suitable for rough and heavy work. The screwed coupling rods of railway rolling stock and fire hoses are provided with this type of threads. (d) Buttress Threads - This thread is triangular in shape and having the angle of 45° at one side and 90° at the other side. It is used where pressure is to be transmitted entirely to one direction. i.e. quick action vice. (e) Worm thread - This thread resembles the acme thread. The angle is of 29°. The bearing strength of this thread is more if it has more depth. It can transmit the power easily at 90°. It works with worm wheel. Generally three threads of worm meet with worm wheel while working.